1. Organic Matters includes art that refers or responds to the natural world. How does your work relate to the broad theme of nature? In my work, the animals are almost always associated with humans; sitting in the palm of their hands, leaning close to a face or floating over a body. They show the presence of nature, the animal aspect of humans and that nature is the reflection of an interior world. It is a mental landscape, a dream world. 2. How does this piece fit into your overall body of work? Is it representative of your oeuvre? Yes, it is representative of my work. 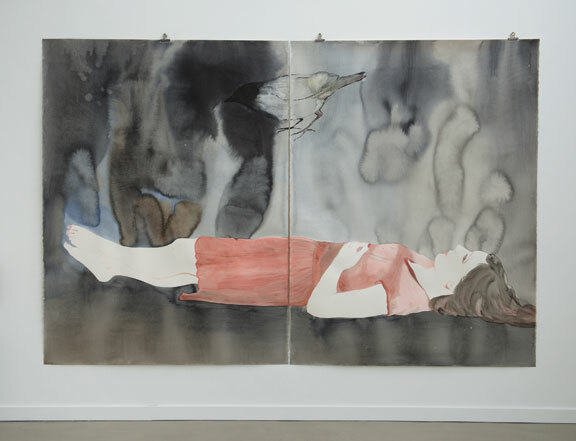 This is a recent series (Les allongés, or “Lying down”), where the body is in the foreground and the bird is in an imagined space. They are big drawings where the space is undetermined. 3. What is your most essential artistic tool or process? Drawing is what drives my work. What I enjoy is its speed in execution, its direct relationship to my thoughts, and its freedom of expression. I enjoy the lightness of touch which it requires. 4. What are your sources of inspiration? I find my greatest inspiration in literature, as I feel it can be very intimate and often reveals that which we refuse to see. I am touched by the novels of Edna O’Brien, Joyce Carol Oates, Marguerite Duras, Anita Desai, Nathalie Sarraute . 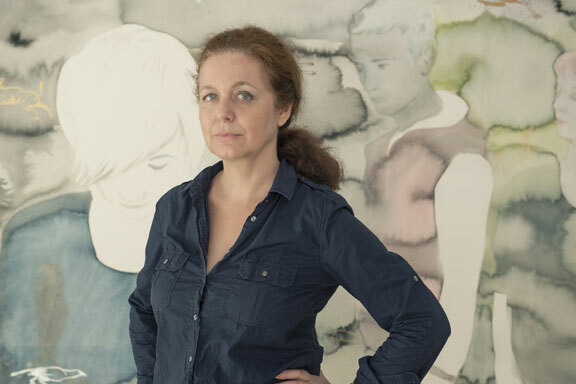 . . books written by women who tell, in their own way, of the intimate relationships between sisters, and between mothers and daughters; these stories resonate with my work as they describe a certain fragility and at the same time the violent relationships these women have with the world which surrounds them. Recently, I went to the Bonnard show at the Musée d’Orsay. I was able to immediately “enter” into his work; one feels as though one is drowning in his ultra-sensitive, enveloping universe. It is amazing to see the same touch, the same light which emanates from the paintings from 1908 and others from 1938. It is a fabulous pictorial lesson of cohesiveness.